Concert tickets for The Milk Carton Kids are $40 and $45 and can be purchased by calling St. Cecilia Music Center at 616-459-2224 or visiting the box office at 24 Ransom Ave. NE. Tickets can also be purchased online at www.scmc-online.org. A post-concert “Meet-the-artist” partywith wine and beerwill be offered to all ticket-holders giving the audience the opportunity to meet the artists and to obtain signed CDs of their releases. St. Cecilia Music Center (SCMC) is proud to bring the Milk Carton Kids and their band to Grand Rapids on February 28, 2019 for the popular Acoustic Café Folk Series. Two-time Grammy nominees and winners of The Best Duo Group of the Year by American Music Group Association, The Milk Carton Kids are an American indie folk duo with Joey Ryan and Kenneth Pattengale, from Eagle Rock, California. An “understated virtuosity” defines their music. In addition to their musical prowess, the duo has performed musical comedy at the 18th Annual San Francisco Comedy Festival called SF Sketchfest, with a brand new variety show, “The Milk Carton Kids Sad Songs Comedy Hour”. The Milk Carton Kids also hosted their second installment of “Sad Songs Comedy Hour” in Los Angeles at the popular nightclub Largo on January 29, 2019. 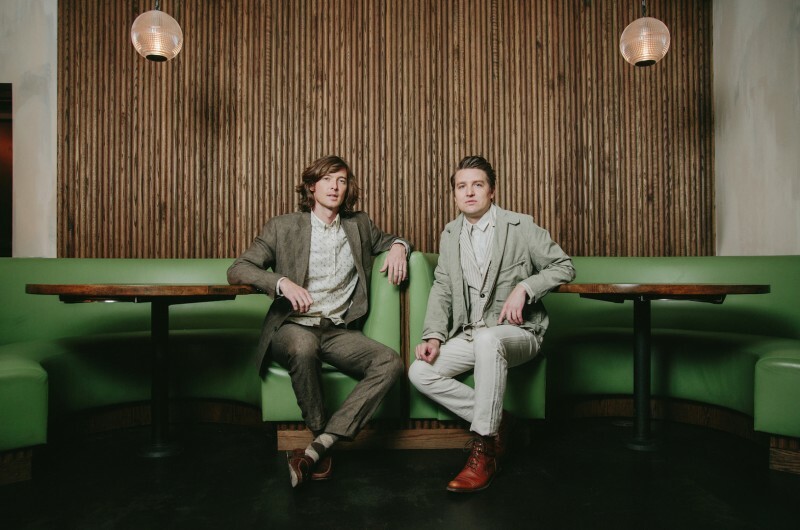 Nominated in 2015 for a Grammy for Best American Roots Performance, Best Folk Album of the year in 2013, and winner of The Americana Music Association for Best Duo/Group of the year in 2014, the Milk Carton Kids released a new album with a full band on June 29, 2018 from ANTI-Records entitled All the Things That I Did and All the Things That I Didn't Do. Joey Ryan and Kenneth Pattengale lives have changed dramatically over the past couple of years. Pattengale has moved to, and is now producing records in Nashville. Ryan is now the father of two children and works as a producer on "Live from Here with Chris Thile," the reboot of "A Prairie Home Companion." A break from years of non-stop touring, Ryan says, has yielded "space outside of the band that gives us perspective on what the band is." Though they didn't approach their newest album conceptually, a theme of shattered realities began to emerge out of the songs that sparked to life. Recent events provided a bruising background for the record, yet the project is somehow bigger than any personal grief. Two-part harmonies ride acoustic guitars high above the haunting landscape created by the presence of the band, as if Americana went searching for a lost America. Produced by Joe Henry and engineered by Ryan Freeland, All the Things That I Did and All the Things That I Didn't Dowas recorded in October 2017 in the Sun Room at House of Blues Studio in Nashville. Musicians who joined them there included Brittany Haas on violin and mandolin, Paul Kowert and Dennis Crouch on bass, Jay Bellerose on drums, Levon Henry on clarinet and saxophone, Nat Smith on cello, Pat Sansone on piano, mellotron, and Hammond organ, Russ Pahl on pedal steel and other guitars and Lindsay Lou and Logan Ledger as additional singers. Mixed by Pattengale, the album was mastered by Kim Rosen. Most recently The Milk Carton Kids closed the 18th Annual San Francisco Comedy Festival, SF Sketchfest, with a brand-new variety show, “The Milk Carton Kids Sad Songs Comedy Hour”. The band performed and hosted an evening of music and comedy with guests including Andy Kindler, Aparna Nancherla, and more. Just this year, a second installment of their “Sad Songs Comedy Hour” in Los Angeles was held at the popular nightclub Largo on January 29, 2019. Kenneth Pattengale has designed and released his own signature Martin guitar, The Pattengale Special. “Four years ago, I set out to design a guitar akin to the 1955 Martin 0-15 (Serial #144667) that I play with The Milk Carton Kids. Affordable, but built with superior craftsmanship, it served as my guiding light for 'The Pattengale Special.' After two years of close collaboration between myself, George Gruhn (of Gruhn Guitars) and Fred Greene (of C.F. Martin & Co.), we’ve achieved a design that pays homage to the workingman’s 0-15 that I hold so dear,” Pattengale says proudly of his new guitar. The guitar is available only at Gruhn Guitars in Nashville, TN. Check out ‘The Pattengale Special’ here. Joey Ryan will appear in two episodes of the new season of HBO’s comedy series ‘Crashing’. The show, from creator/star Pete Holmes and Executive Producer Judd Apatow, follows the career of a young comedian who pursues a career in stand-up (Holmes) and features appearances from many of the biggest names in comedy including John Mulaney, Amy Schumer, and Ray Romano. Ryan says of his first non-musical acting role: “Pete asked me to read for this new character on his show who is not a musician, so at first I thought there must have been some mistake. But he gave me the confidence I needed, and I got to spend a week in New York with Pete and Judd and a room full of the funniest people in the world, just watching them do their thing, and trying to keep up. It was totally inspiring and intimidating and improvisational. I guess they left some of my lines in.” The eight-episode third season began airing on January 20 at 10pm. The War and Treaty will perform on Sunday, February 24, 2019. “Chilling”, “soulful”, and “powerful” are just some of the words used by audiences and the media to describe The War and Treaty. Their "Down to the River" EP released in 2017 is both stirring and sensual, driven by joy, determination, and an unceasing upward gaze. Their current 2018/2019 tour shares songs of reconciliation and humanity, and takes listeners on a soaring, emotional ridefrom their latest album Healing Tide. The Milk Carton Kids will perform at SCMC on Thursday, February 28, 2019. Asleep at the Wheel will return to SCMC on April 11, 2019. Over their history, Asleep at The Wheel has earned ten GRAMMY Awards and released more than 25 studio and live albums, and there is no sign of them slowing down any time soon. Guitarist Leo Kottkewill return to SCMC on April 18, 2019. Over his many years of writing and performing, Kottke has composed scores for film soundtracks, children’s shows, and a symphony, as well as, released many albums. Focusing primarily on instrumental composition and playing, Kottke also sings sporadically, in an unconventional yet expressive baritone and intersperses humorous and monologues with vocal and instrumental selections played solo on his 6- and 12-string guitars. Additional concerts within the Jazz Series and the Chamber Music Society of Lincoln Center Series highlight SCMC’s 2018/2019 season celebrating their 135-year history as the oldest performing arts organization in Grand Rapids and West Michigan.